Have you ever witnessed an eye surgery on a dog? Twelve-year-old Tim Brandt spent his last day of summer holidays as a ‘future vet’ with Bondi Vet stars Dr Lisa Chimes and Dr Andrew Marchevsky at the Small Animal Specialist Hospital (SASH), the home of the popular TV series. The Year 7 student from Balgowlah Boys High School has a great story to tell his school friends about meeting the celebrities, probably igniting a buzz of chatter in the school’s hallways for some time to come. 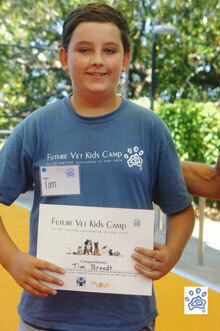 Tim attended Future Vet Kids Camp in January and won an essay writing competition about what it takes to be a veterinarian. 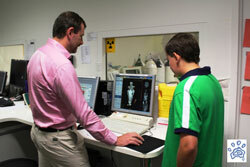 He received a private, behind-the-scenes tour of SASH by Dr Chimes and Dr Marchevsky, followed by morning tea. “It was lovely to meet Tim and show him around our wonderful hospital,” said Dr Chimes, who has been working at SASH for seven years. Dr Marchevsky also took Tim to observe a surgery by one of SASH’s eye specialists of a dog being treated for glaucoma, a painful eye disease. Tim was impressed that pets today receive such a high standard of specialist care for their illnesses, from ophthalmology, cardiology, neurology and dermatology treatments to radiation and chemotherapy for cancer, all available at SASH. Tim also brought his dog, Tochka, to meet the famous vets and get advice for a bad habit that has gotten the three-year-old English Setter into a lot of trouble since he was a puppy. Good thing Tochka didn’t steal the delicious snacks prepared for Tim following the tour! What is Future Vet Kids Camp? The Future Vet Kids Camp teaches nine to 16-year-olds about working with animals in a fun, educational and up-close-and-personal setting, inspiring them to make a difference in the world from a young age. The camp is run by Canadian veterinarian Dr Scott Bainbridge, popular for his regular appearance on the TV show Animal House Calls on Animal Planet. He loves to share his passion for 'the greatest job in the world' and seeing kids get excited about pursuing their dream to work with animals. "It is important that children learn to respect and have compassion for animals. We need to teach them especially now in this age of climate change and dwindling habitats," says Dr Bainbridge. "Children who are kind to animals and appreciate their diversity also learn to value one another as adults." 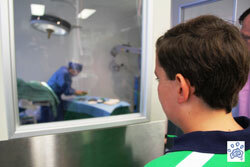 Operating out of the Waverley College Junior Campus in Waverley, Future Vet Kids Camp runs every January for two weeks and is split into three separate programs running simultaneously each week: Wombats (9 - 11-year-olds), Kookaburras (12 - 14-year-olds) and the Junior Vet program (14 - 16-year-olds). The camp schedule is packed with fun and educational talks by veterinarians, behaviourists and staff from animal rescue, reptile, small animal and canine sports groups, as well as guided tours at facilities such as the Small Animal Specialist Hospital (home of Bondi Vet), Camden Teaching Hospital, Cat Protection Society, Featherdale Wildlife Park, Sydney Dogs and Cats Home and much more! The next Future Vet Kids Camp will run in January 2016. Keep your paws on www.futurevetkidscamp.com.au for more information regarding the daily schedule of the programs and ‘early bird’ online registration.